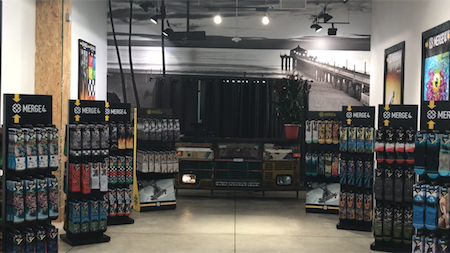 Merge4, makers of quality-driven, comfortable, durable, modern socks, has opened their flagship retail store on State Street in the heart of Santa Barbara, California. Across from the Metro Theater and surrounded by Volcom, Vans, Urban Outfitters and Billabong: 623.5 State Street is where the entire MERGE4 collection is on display for inspection and selection: 2,000 square feet of graphic socks – the perfect gift for Christmas, Hanukah, Kwanza or Festivus: “Visually artistic socks, featuring some of the best their industry has to offer,” said MERGE4 founder Cindi Ferreira-Busenhart. For the official word from Merge4, please follow the jump. SANTA BARBARA, CALIFORNIA Holiday shopping just got cooler and warmer, now that MERGE4 is showing their entire collection of environmentally-correct, graphically-energized socks at their flagship store on State Street in Santa Barbara. MERGE4 is your entry point into the world of contemporary socks: Quality-driven, comfortable, durable, modern socks that are both warm, cool and functional. MERGE4 socks are made from environmentally-responsible materials – like the new mechanical bamboo blend – and illustrated with art, graphics and action from a stable of athletes, artists, musicians and other collaborators spanning genres and generations: Wee Man, Steve Caballero, Landon McNamara, Jay Moriarity, Jimbo Phillips, Bad Otis Link, Eric Dressen, Nathan Fletcher, Timmy Reyes, Ed Colver, Greg Minnaar, Spidey Demontrond, Cedric Gracia, Shawn “Barney” Barron – and featuring Skylar the Surfing Dog. You can expect MERGE4 festivities for First Thursday – a traditional evening of art and culture in downtown Santa Barbara on the first Thursday of each month. MERGE4 will jump in with both feet and you can look forward to meeting MERGE4 society members and ambassadors at the store for First Thursday. MERGE4 is a certified B Corporation – focusing on doing business for good. The MERGE4 collection will knock your other socks off, and they are now on exhibit at the Santa Barbara store. About MERGE4: MERGE4 is a sock company based out of Santa Cruz, California. A Certified B Corporation that uses business as a force for doing good. Beyond magnificence in appearance, style and comfort, MERGE4 socks are constructed like no other. Your soles are GRIPPED by our deviously interesting ‘CULT-WEAVE.’ Which cushions what is sometimes called the ‘arch’ area.